Notes: Based off of the fourth volume of the "Long Novel" called "End of Day by Day". It's tough to keep your grades up without having to take off at a moment's notice to save the world. But for Sousuke Sagara, undercover high school student and member of the mercenary group Mithril, life in Tokyo seemed the same as always. But underneath the promising exterior spin the wheels of a conspiracy that threaten to destroy the peace. A new threat has arisen: The military conglomerate known as "Amalgam." An unknown element with advanced "Whispered" technology, this mysterious organization has been running things from behind the scenes. As dissension spreads throughout the ranks of Mithril, Sousuke faces his own internal struggle. Spread thin between schoolwork and war, the powers that be have decided to lighten his load... beginning with Kaname! For what this series is (a sequel) I can't help but think that this is the treatment that every fanboy wishes his favorite series would get. In a word, it's absolutely incredible. THIS is the kind of sequel that every series hypes its next chapter to be. THIS is what it means to have a successor actually do justice to its original material. THIS, ladies and gentlemen, is what it means to have a real, bona-fide sequel. End of story. You know, fresh from the lighthearted, purely comedic Fumoffu, the last installment in the Full Metal Panic series, I was really scared that that was all that they were going to do. Not that I didn't mind a brief "comedic relief interlude," but I was afraid that that was where they were going to leave it, and not really do justice to the serious story behind FMP that hooked most of us in the first place. I am glad to say that my fears were unfounded, however, and I am so glad they decided to do a story from the more serious "Long Novel" for this installment. This really serves to bring the fans back down from the sugar-coated highs of Fumoffu and remind them why they enjoyed this series in he first place. This is not to say that I didn't enjoy the jokey, completely comedic "Short Novel" series (Fumoffu) for a time, but one segment of that was definitely enough, and reminding the fans why this series became poular can only be a good thing. Not to say that there's no humor whatsoever in this segment, since Full Metal Panic would feel so empty without that, but there is a definite more serious tone that you cant help but notice, and that forces you to really take this series much more seriously than you ever would a lighthearted romp like Fumoffu. For the novice reader/anime viewer though, lets back up a few steps. 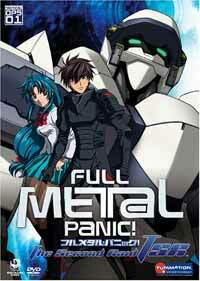 The source material for the Full Metal Panic anime comes from teen-aged-aimed novels, divided into two categories: The "Long Novel" (Which the Original Full Metal Panic series and this segment are both based on) and the much lighter, more comedic "Short Novel," from which the series Fumoffu was derived. In particular, The Second Raid is based off of the fourth volume of the "Long Novel" called "End of Day by Day." With the bar set so high by the story/plot aspects of this series, I am also glad to report that the animation quality backs up the story 110%. Detailed characters, crisp action sequences, yep, it's all there, thank god for a good animation budget. Just goes to show us, yet again, how we wish all of our sequels were handled like this...I am so jealous, but at the same time glad I was able to witness this, so that I know that a well-done sequel does actually exist somewhere other than in my imagination! Now, I'm not saying that there aren't a few holes, of course. This series isn't perfect, just ungodly close. For a couple of examples: In the story, there is a definite lack of military professionalism in the interpersonal interactions between the "good guys" that could just be explained away by the military company being "mercenary," despite the company's high level of expertise. Really though, it just proves to me that the military aspect is a plot tool to provide the setting for the story, and not really something to be taken seriously. The same could be said of the "military conflict" that's built up so much during the series, but then handled fairly quickly near the end. I guess that's what can happen when you have a "god mode" for certain robots - it's like there's nothing that can't just be explained away by "the x drive let him do that" or "the whispered technology, omg!!!!!!!" Whatever, it's entertainment, and an interesting background for a teenage love-story. That's all, and really, that's good enough for me. In conclusion, I do recommend watching at least the first installment before viewing this, just to get some history, and the full picture on all of these awesome characters. But after that, go wild, enjoy, and you can thank me later for recommending it to you. If only every sequel was this good! Recommended Audience: Older Teens and up only. Violence, mature situations and language keep this out of even the "younger teen" category.